The Richmond Battlefields Association (RBA) has pledged to protect the historical integrity of the battlefields near Richmond, Virginia, by preserving them from destruction. 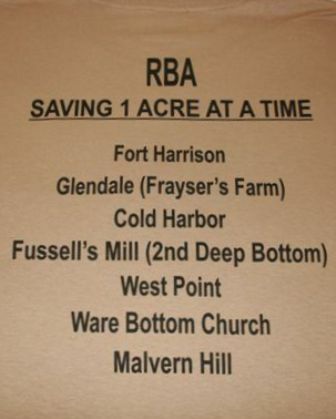 The RBA hopes to achieve this goal by promoting historical preservation in general, and by educating the public about the tremendous importance of these Richmond battlefields. We believe these places, this hallowed ground, teach us unique and priceless lessons about who we are as a nation. Richmond Battlefields Association is a 501(c)(3) non-profit organization. Your contributions may be deductible as provided in 26 USC Sec 170. Above: RBA annual meeting at historic White House Landing in New Kent County (June 2008). 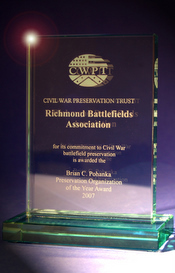 In 2007, RBA was recognized by the Civil War Trust for its leadership role in the campaign to save the Glendale battlefield. Now entering our second decade, RBA continues to fight the good fight for battlefield preservation.